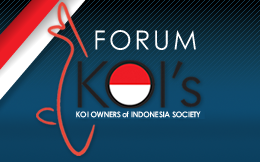 Sticky: FLASH NEWS : 11th ASIA CUP KOI SHOW 2018 is coming to INDONESIA ! Sticky: . : 8th KOI's Merah Putih & 2nd ZNA Young Koi Show 2017 :. Sticky: . : 11th KOI-s Festival 2017, 7-9 April 2017 @Q BIG Mall BSD City:. .:. 10th KOI's Festival @ MGK Kemayoran, 8-9 April 2016 .:.